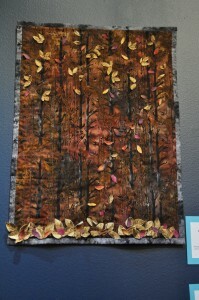 The annual Fine Art of Fiber festival was this past weekend at the Chicago Botanic Gardens. 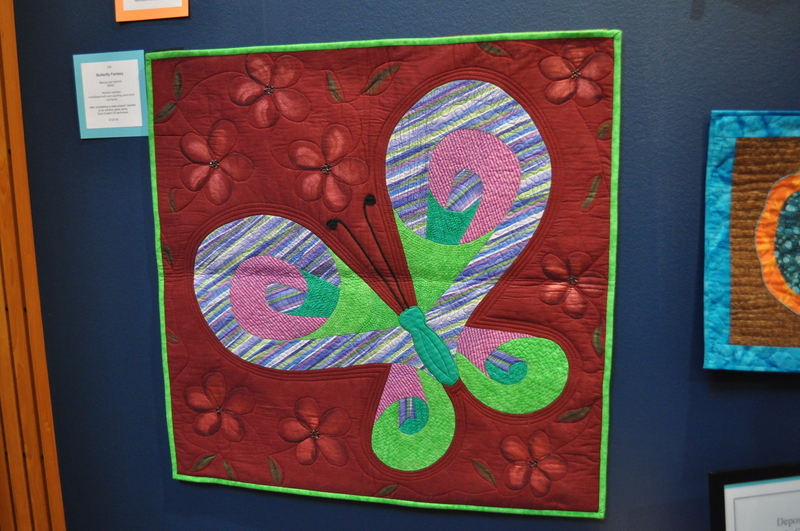 The festival is put on by the Illinois Quilters, the North Suburban Needle Arts Guild, and the Weavers Guild of the North Shore. We were expecting something fairly small, maybe a few rooms of pieces on display. We were completely unprepared for the size of this show. 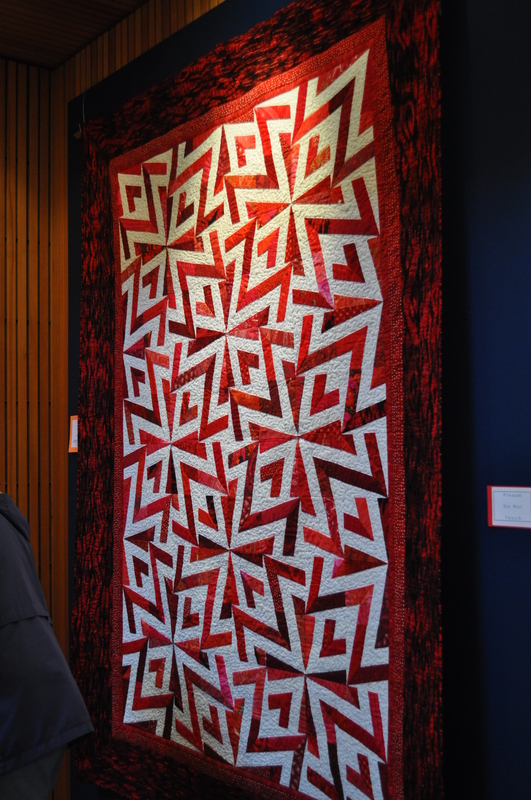 There were at least 3 display rooms with every surface covered in quilts, a display of handmade aprons, and two large rooms full of weaving and other crafts for sale. I expected that we’d spend an hour or two and then go for a stroll around the gardens afterward. We spent the entire day. This was one of my favorite pieces in the show. 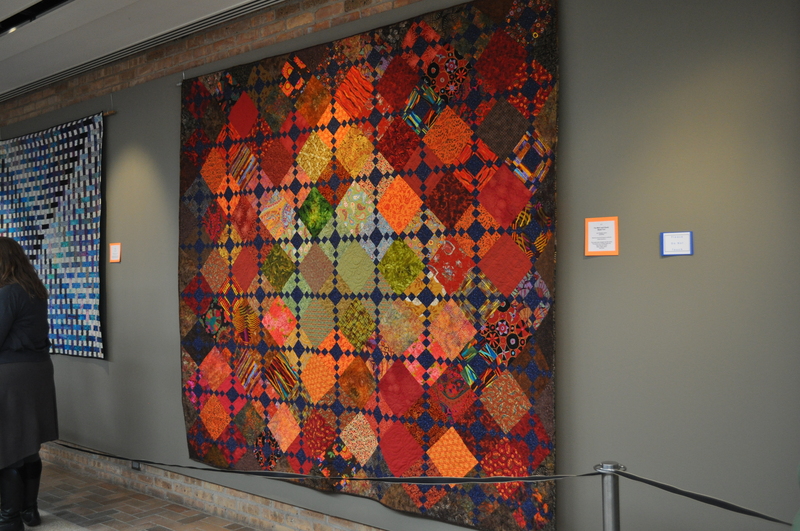 I love how the quilter used different values and saturations of color to really make the squares pop. 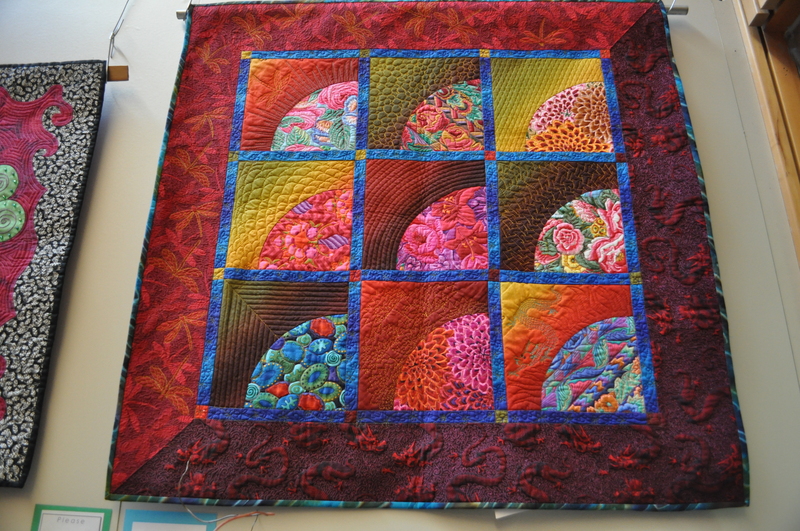 It’s also interesting how the different colors interact; I wouldn’t usually think to mix pink and orange, but they complement one another beautifully here, and I think that contrast is part of what gives the quilt depth. 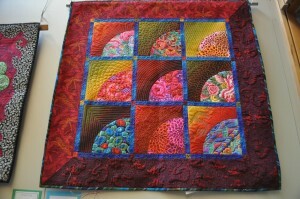 Their placement also keeps your eye moving around the quilt, giving it a really dynamic feel. 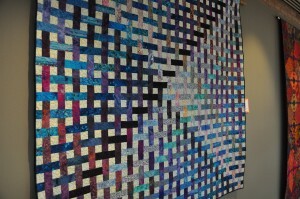 Quilting, like weaving, is all about color composition. It’s something I’m not very good at (yet), but I appreciate it in others’ work. We kept circling back around past this one throughout the day, and every time I passed I liked it more. 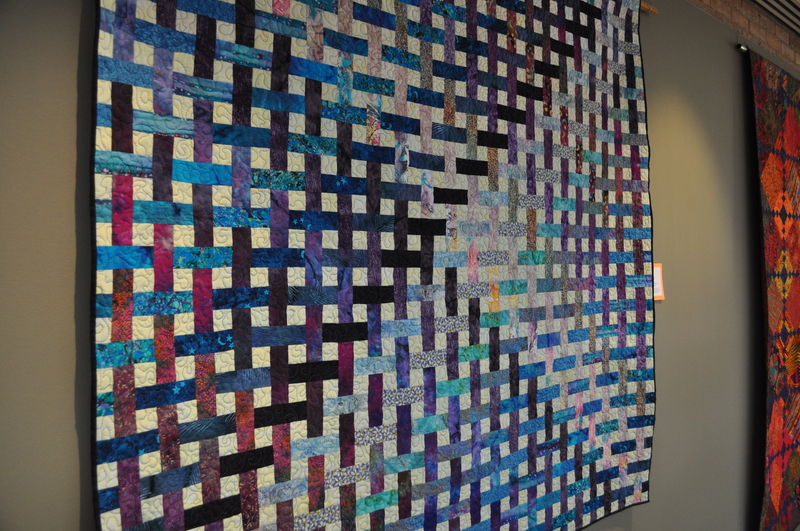 Here’s another one where the color pattern was carefully chosen to highlight the woven look of the quilt. This must have been an awful pain to construct, since those pieces can’t be sewn as squares and have to be pieced as “L” shapes (corner seams don’t tend to like to lie flat). This one I liked for the sheer boldness of its design, and it’s jagged feel. It’s saw edges and z’s and broken glass all at once. I’ve read somewhere that there are certain commonalities in how sounds are represented across languages and cultures; that a curvy shape has a soft sound, and a sharp shape represents hard, crisp sounds. 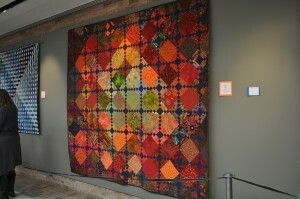 To me, this quilt is the visual equivalent of that. It practically crackles, doesn’t it? This was almost the exact opposite. Subtle, calm, understated. A forest of trees that is almost there, and almost not. I think the background fabric on this one was handpainted, too. Loved the color blending, and the way the three-dimensional leaves brought out the background. This piece was another jaw-dropper in terms of color composition. 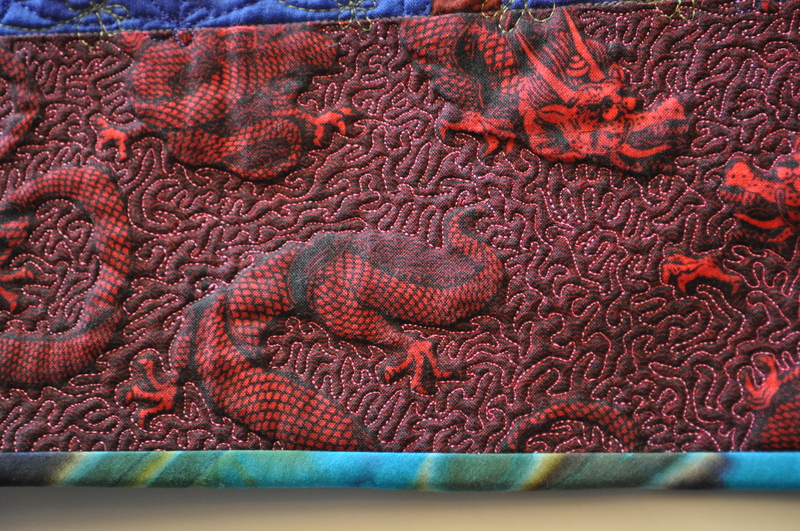 And just look at the details in the quilting! 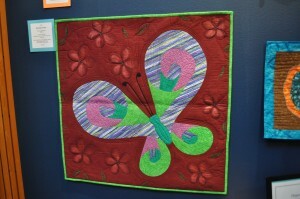 Another thing that this show really brought home is the importance of beautiful quilting to finish a piece. I don’t have much to show there, because it’s hard to take pictures that actually show quilting, but when well done, it really elevates a quilt from nice to spectacular. 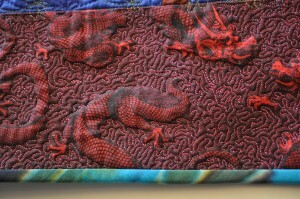 Here’s an example of a very plain background that became a lot more interesting with quilting. All those flowers are quilted in. Without those details, the butterfly would be on a plain red background. As with anything, I suppose, the genius is in the details, and in pulling them all together to make a coherent whole. It was fun to spend a day studying so many masterpieces. There was a woman demonstrating bobbin lace, which I’ve been tempted to try for quite some time. She managed to make it sound quite simple despite its apparent complexity, too. Turns out that’s all just one “stitch” too. 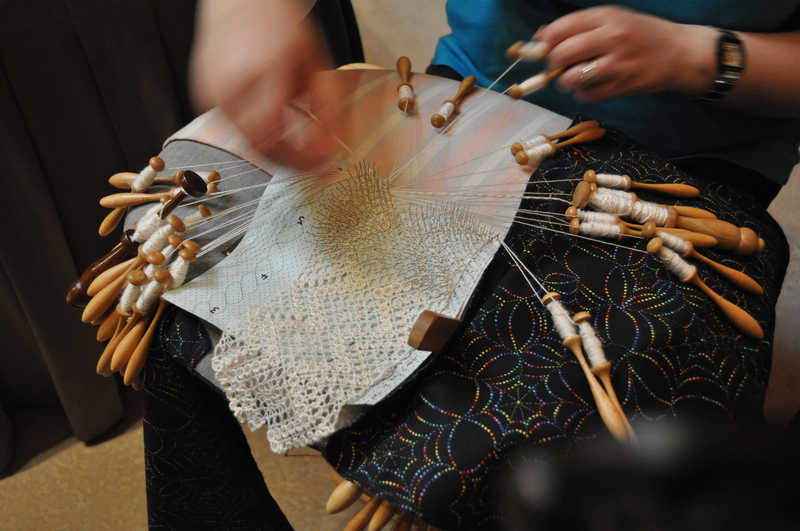 Just like knitting…you take one simple thing and make complicated patterns. She had a sample for people to practice on. I declined, out of fear of gaining another hobby on the spot. Fortunately, I know I will never run out of things to explore in the craft world. We also sat in on a lecture by the owner of Kasuri dyeworks about Japanese textiles. I didn’t take photos, but it was an amazing hour, packed full of information about the techniques of Japanese master dyers and weavers. There is so much history in those pieces of fabric. It literally takes a lifetime to master these crafts (she said that one of the weavers she works with is considered “up and coming” after 30+ years of apprenticeship). We found ourselves shaking our heads and saying “only the Japanese” so often during the lecture. There is so much careful attention to detail, so much miniaturized and painstaking work, and such emphasis on perfection of their craft. The fabrics were truly beautiful, and the culture behind them was just as interesting. I’d highly recommend that anyone sit in on one of these lectures if you get the chance; even if you don’t weave or dye, it was an amazing way to spend an hour. We didn’t take photos of the woven pieces on display, unfortunately. They didn’t have any for show only, and people can be funny about you taking pictures of things that are for sale, so we opted to just look. I’ve decided that I really must play with huck lace, and have reinforced the idea that I want to weave very fine (50-100 ends per inch seems like a good goal for now, just as soon as I can get enough heddles to thread the loom with that many ends!). I also discovered that I like very lightweight chenille much, much more than the slightly heavier-weight kind that I’ve usually seen. We saw some examples of garments with beautiful finishing details, which is of particular interest to me because that’s where my weaving is headed (eventually, anyway). Again, the details really make the piece. I only barely managed to avoid taking a finely finished jacket home with me as a new addition to my wardrobe. Next year, maybe. Regarding Japanese dying/fabric work, a couple years ago, we were fortunate that a display of art Kimonos from Japan (by Itchiku Kubota) was shown locally at the art museum–they were simply astounding in their craft and beauty. Wow, those are so beautiful! Love love love the effects the artists created. Beautiful stuff. And art is in the eye (or ear) of the beholder. 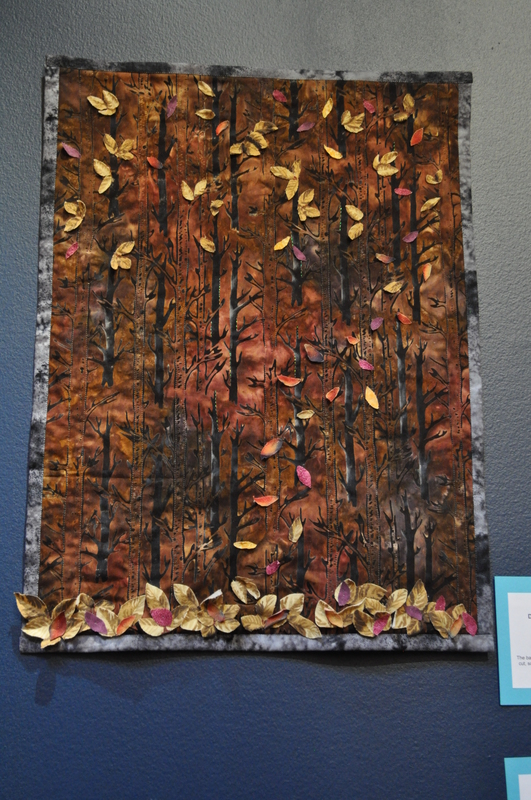 That forest of trees quilt rustles in my mind – all those autumn leaves under my feet! Not only did I enjoy seeing the photos of beautiful craftsmanship but I also enjoyed your insights and comments about the colors and shapes. 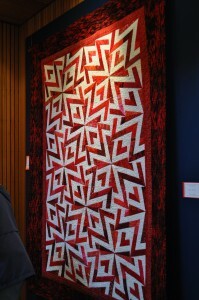 I love appreciating quilting but could never do it. I can’t sew a straight line, nevermind a curved one! DesigKnit is powered by	WordPress 4.8.9 . Page generated in 0.647 seconds using 39 queries.